China’s Civil Aviation Administration ordered the temporary grounding of all Boeing 737 MAX 8 aircraft flown by Chinese airlines following a crash of one of the planes flown by Ethiopian Airlines. The order by the Civil Aviation Administration, issued on Monday morning, said all Boeing 737 MAX 8s in China must be grounded by 6pm local time. Caijing, a Chinese state-run news outlet that covers finance and economics, said many flights scheduled to use 737 Max planes would instead use the 737-800 models, stated a Reuters report. As scrutiny intensifies on the United States manufacturer’s best-selling jet, the blanket grounding in one of the world’s biggest market is a further blow to the company’s reputation. Ethiopian Airlines’ flight ET302 plunged to the ground minutes after leaving Addis Ababa en route to Nairobi, Kenya, killing all 157 people on board in what was the second deadly accident in five months involving the model. Last year, on October 29, a 737 MAX flown by Indonesian budget carrier Lion Air flying from Jakarta on a domestic flight crashed 13 minutes after take-off, killing all 189 passengers on board. A preliminary report into that disaster indicated that pilots struggled to maintain control following an equipment malfunction. 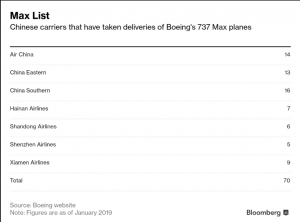 A Bloomberg report quoted the Boeing’s website stating that Chinese carriers accounted for about 20 per cent of 737 Max deliveries worldwide through January. China Southern Airlines has 16 of the aircraft, with another 34 on order, according to data through January on Boeing’s website. China Eastern Airlines has 13, while Air China has 14, Boeing says. Other Chinese airlines to have bought the Max include Hainan Airlines and Shandong Airlines, the data shows. Indonesia’s transportation safety committee said on Monday it will discuss the possibility of grounding Boeing 737 Max jets operated by the nation’s airlines. Jet Airways India and SpiceJet, two Indian airlines that use the 737 Max jet, and the country’s regulators have asked Boeing for information following the Ethiopia crash. Cayman Airways, the flag carrier airline of the Cayman Islands, says it is suspending operations of both its Boeing 737 Max 8 aircraft, effective Monday, “until more information is received”. Singapore Airlines, whose regional arm SilkAir operates the 737 MAX, said it was monitoring the situation closely, without providing further details.